As adults, some of us pride ourselves in our sophisticated dessert tastes—we reach for custard-filled eclairs, decadent fruit pies, and tiramisu whenever we find ourselves at a dessert buffet, we order the most complicated-sounding ice cream flavor every time we set foot inside of an ice cream parlor, and we turn our noses up at boring, vanilla-flavored packaged snack cakes that sit in abundance on supermarket shelves. When it comes to dessert, some adults can be downright pretentious. 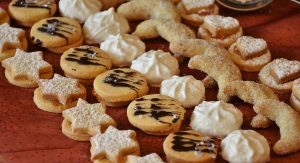 Still, almost all of us love to indulge in the occasional cookie; cookies are one of the most popular, widely consumed sweet treats in the United States. They are easy to make, versatile, and they are perfect for any weather or time of day. We know that our doctors probably will not tell us we need to increase our cookie intake any time soon, but most of us feel perfectly safe eating these little snacks in moderation. Eating too many of them is bad for us, but we can get away with the occasional chocolate chip cookie without suffering any serious health problems, so we are happy to indulge. But can we share these snack-sized treats with our pets, too? Can you give your cat cookies? The short answer is no, you should not give your cat cookies. 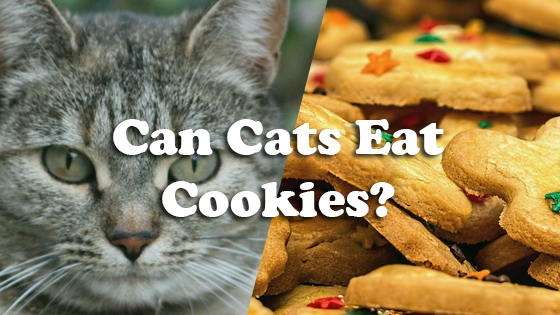 The long answer, however, is: technically, your cat can eat some types of cookies, but they would be much better off if they avoided them—and they probably would not enjoy them anyway! Though we go crazy for cookies (and we feel like we have earned them as long as we have eaten a healthy diet for the rest of the day), they are made entirely out of ingredients that are bad for our cats. Your furry friend will most likely be okay if you give them a small piece of your fresh sugar cookie, but, if they start eating cookies regularly, they can develop serious health problems. As responsible pet parents, we should opt for more feline-friendly treats than cookies. In terms of nutrition, cookies have no redeeming qualities—almost every ingredient in your favorite cookie recipe is something that your cat should not eat. Most cookies are made out of refined flour, refined sugar, butter, milk, and a variety of spices and mix-ins that can cause health problems for your precious cat. While humans can usually handle the occasional sugary snack, our cats are not biologically equipped for any of these ingredients. Humans are omnivores who thrive on diets that include moderate amounts of carbohydrates, both in the form of complex carbohydrates (found in starchy foods like bananas and potatoes) and simple sugars (which are found naturally occurring in sweet fruits like apples, berries, and peaches). Though eating too many simple sugars can cause insulin resistance, diabetes, and other health problems, consuming carbohydrates in moderation is important in order for us to maintain health and fitness—after all, we burn sugar for energy! Cats, on the other hand, are obligate carnivores—their diets are far stricter than ours. In the wild, your cat’s entire diet would consist of one food group: the flesh of whole prey animals like mice and birds.  As a result of this limited diet, housecats only have the biological equipment required to process meat and other protein-rich foods. Unlike humans and dogs, they lack many of the biological adaptations necessary to efficiently process carbohydrates (sugars). Cats thrive on diets that are high in protein, moderate in fat, and incredibly low in carbohydrates; wild cats only eat carbohydrates when they consume the plant matter in their prey’s stomachs (and, occasionally, when they chew on grass to settle their upset tummies). Cats can and will metabolize sugar (which is why our furry friends often wind up fat when we start sharing our desserts with them), but it is not healthy for them. Cats who consume snacks that are made with refined sugar and refined flour often gain weight, and they can quickly end up overweight or even obese. Feline obesity greatly increases your cat’s chances of developing diseases like heart disease, insulin resistance, diabetes, arthritis, and several forms of cancer—all of which can reduce their lifespan by over two years. Over half of all domesticated cats are overweight or obese, so it is safe to say that we don’t need to give them any extra calories! The refined sugars in cookies can also contribute to insulin resistance and diabetes. Cats are already rather prone to hyperglycemia (high blood sugar), so keeping sugary snacks away from them is a good way to lower their risk of chronic disease. Some types of cookies can even kill your cat. Cookies that include ingredients like chocolate and raisins can poison your pet even in small quantities—because most cats are quite small, it does not take very much of these toxic foods to kill them. If your cat eats a chocolate cookie, watch out for symptoms such as diarrhea, vomiting, high fever, increased reflexes, anxiety, stiff or rigid muscles, rapid or labored breathing, low blood pressure, seizures, collapse, and cardiac arrest. Left untreated, chocolate poisoning often leads to heart failure and death. This is why it is crucial to keep all of your baking chocolate away from your furry friend! Finally, there is no good reason to give your cat cookies because cats can’t even taste sweetness—all of that sugar is totally lost on them. Cats are the only animals who are lacking the genes required to produce the taste buds that detect sweet foods, which means that your furry friend doesn’t have a sweet tooth to satisfy. So, when you consider that sugar is horrible for them, and they cannot even enjoy it anyway, why would you want to give it to them? In conclusion, there is no good reason to feed your cat cookies. Cookies are loaded with refined carbohydrates that can contribute to obesity and diabetes. Cookies often contain ingredients like chocolate and grapes, which can cause fatal toxicity in cats. These are heavy prices to pay for a food that your pet can’t even enjoy properly—your furry friend’s lack of ‘sweet’ taste buds means that they are unable to appreciate the sinful sweetness in your sugar cookies. Pass on this food and opt for something more cat-friendly. Can cats eat hot fries? Can Dogs Eat Sweet Potatoes? Can Cats Eat Chili?